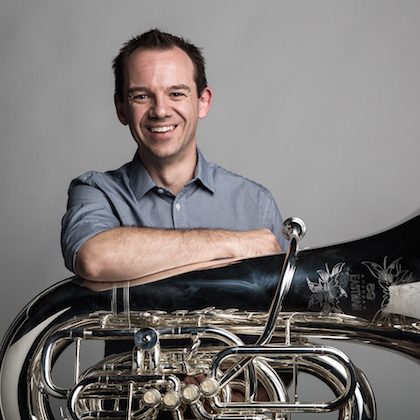 A lifelong resident of Southern California, Scott Sutherland has been hailed as “the second craziest tuba player I know” by famed American composer, Joan Tower. He is a member of the Redlands Symphony, Riverside Philharmonic and has been spotted in the back row of the Chicago Symphony, Los Angeles Philharmonic, Colorado Springs Philharmonic, and San Diego Symphony. Likely due to clerical errors, Scott has per- formed at the front of the stage as a soloist with the San Diego and Idyllwild Arts Symphony Orchestras, as well as the Riverside and Burbank Philharmonics. He has also recorded for film, television and video game soundtracks, including the major motion pictures Pearl Harbor and Batman vs. Superman (which are the only accomplishments notable to his younger private students). For 11 years, Scott was a founding member, tubist and pianist of the international touring ensemble, Presidio Brass, for which he continues to work with as a consultant and music arranger. During his time with the quintet, he performed in over 40 states, Canada and China. Scott can often be found behind his MacBook Pro, slaving away for hours on end adapting music. His arrangements have been performed by ensembles throughout the world, including the Principal Brass of the New York Philharmonic, famed tubist and conductor Roger Bobo, as well as chamber groups from the West Point Band and the “President’s Own” Marine Band. Scott’s “Fantasy on Porgy and Bess” for trumpet and orchestra was commissioned by soloist Barry Perkins and has been performed with the Pacific Symphony (California) and the Aguascalientes Symphony (Mexico). He began a popular YouTube Channel in 2016 which includes multitrack videos of film, television and video game music, featuring Scott playing euphonium, tuba, cimbasso, piano and percussion. In its first year, the channel was viewed over 500,000 times. Beyond his performance career, Scott is a passionate and dedicated teacher. He is currently on the faculty at the University of Redlands, Idyllwild Arts Summer Program and Gene Pokorny Low Brass Seminar. Despite all of this, Scott’s foremost identity, besides being an avid beer and whiskey snob, comes as a husband and father to his beautiful family and he is grateful to come home to Carlsbad, CA where it never fails to be 70 degrees and sunny all year round. Scott Sutherland is proud to be an Artist and Clinician for the Eastman Music Company.